We are all guilty of throwing around the latest and greatest "buzzwords" in response to the new digital age, but we often lose sight that business value and digital growth are not always connected. Just like buying and wearing fitness clothes doesn't necessarily make you a fit person, looking like a digital business is a lot easier than actually being one. Every company wants to be digital, and they want to launch the next new engaging mobile app, use cloud technology to meet changing demands, and turn their data into key decisions. We get so wrapped up in the buzzwords, that we forget the basics. You can't automate old business tasks and call yourself digital. True change and impact requires re-imagining the way you have always done things. Change and disruption are nothing new. When the automobile came to age, the horse and carriage makers never thought their world would change. When the internet came along, Blockbuster never imagined videos could be streamed. The difference between then and now is pace. There was more time to adapt and adjust years ago. 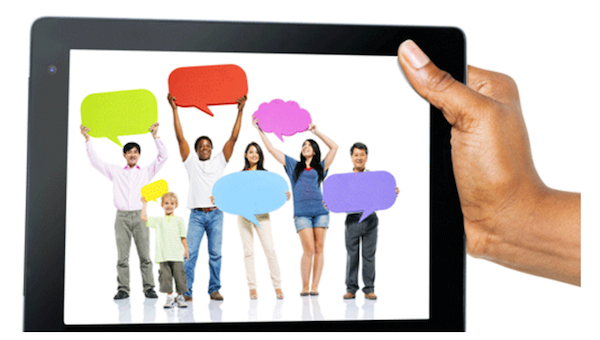 Today, technology and society are evolving at such a rapid pace, businesses can't keep up. Customers' and employees' behaviors, expectations, and values shift by the second. We are constantly faced with the dilemma to invest resources and budgets in business as usual, versus the new digital journey. Companies hesitate to make workforce changes to give them the skills and leadership they need for future survival. "We are not a technology company!" "I am not a business person." Those comments always surprised me, but saying any of these statements today is like saying you don't care about your customers. The lines have blurred between technology and business; there are skill overlaps and knowledge gaps, which cause costs to spike. In response, companies are hiring consulting firms, "millennials," and "digital skills" to tell them what to do. We forget the same holds true, and you can't have someone give you a strategy, hire some skills, and then call yourself a digital company. That's like saying you're a traveler, going to another country, and never leaving your cruise ship. We have to set aside traditional models and fears and re-imagine our organization and workforce strategies. I had an opportunity to speak with the next generation of dreamers and doers at high-school robotics and coding camp about careers and skills in STEM. There was a common question the students said they battled: "What do I want to be when I grow up?" "What skills do I need to be successful?" I was blown away at how worried our new generation was about titles and technical skills, instead of focusing on creativity. I couldn't believe how the game has changed, but our school system is the same. Then I realized our corporate and business systems are also the same way! What is the first thing you ask in a corporate setting? "What's your title?" "What do you do?" Our global market has changed, but both education and corporate models are still ancient! There is a major skills shortage, and everyone from the president down is trying to address the need for better STEM education. Companies are involved to drive the shift in these careers, but what about a shift in both education and corporate systems to align and work together? If the market demands millions of degrees in technology, engineering, and business knowledge, then both systems must change, and we'd better be sure those degrees translate into real-world careers and value. Data scientist, cloud engineer, VP of finance, chief medical officer-the title and skills list goes on. To truly shift and determine the digital strategies, we need to look from the inside out and experiment with non-traditional ways, including partnerships, structures, and the way we work. Here are a few key areas to look at holistically as you RE-IMAGINE your workforce strategy. 1. "Business and Technology Alignment" Buzz—Meaning, look at Your Workforce as ONE. Professional coaches can monitor their athlete's heart and lactate rates from a tablet real-time during a game. Doctors can perform robotically assisted removal of tumors. Cars can be recommended based on your preferences, social graphs, and previous purchases without walking into a showroom. Technology and business are now the same. To think you can continue to run the same separate strategies, organizations, skills, and structure is an expensive and outdated business model. This model may keep you from being more competitive in the marketplace. You need to look at all your leadership skills, people skills, partners, vendors, and technologies. Look at merging the two cultures of IT and the business because it's all the same in this era. 2. "Workforce Strategy" "Vendor Strategy" Buzz—What This Means Is It's All Converged into One Skills Strategy. You cannot outsource things that create a competitive edge, but do you know what your competitive edge is? Do you scan the global market to check that what you think is unique about your edge isn't turning into a commodity? To respond, you need to determine that equation first, then determine what you're keeping in-house versus outsourcing, and course correct. Skills have overlapped and converged with vendors, partners, and your internal teams; therefore, you have to treat the two strategies as "one skills strategy." 3. "Freelance Workforce" Buzz—Means We Must Change the Way We Work! It is estimated that 43% of the United States workforce is expected to be freelance by 2020. The new working economy is growing and not going away. Everything is shifting to a flexible and shared model. Look at Uber, Airbnb, and ZipCar. This now also includes the corporate workforce. The new crowdsourcing and skills model needs to tie into your one skills strategy. 4. 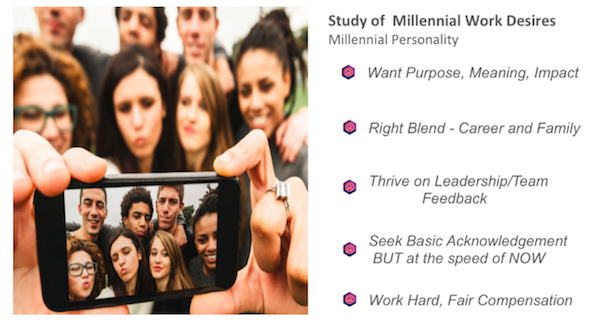 "Millenials" Buzzword—do You Want Purpose And Meaning In Your Work? Do You Want To Have An Impact? Do You Want Simplicity? 5. "Social Media Strategist" "Data Scientist" "Financial Analyst Guru" Buzz—Titles and Skills Have Gone Wild. 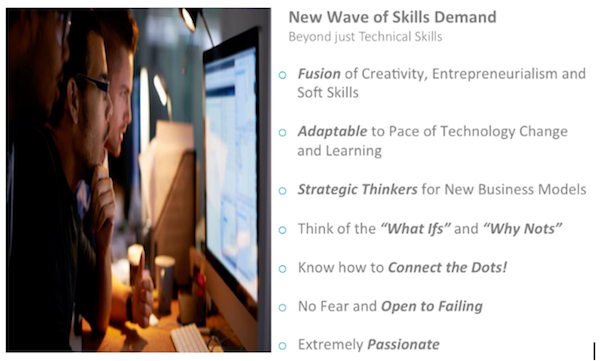 These technical and business skills taught in schools are needed, but the most important foundational skills to keep up with the pace of critical change is often not taught or measured. Core skills, such as creativity and innovation, are what will create a competitive edge; the rest are commodity skills that could be filled by global partners. Here are a few of these skills that are in high demand. 6. "Culture" Buzz—What Comes First: Culture or Leadership? Many People Think Culture Is the Foundation for Everything, but It's Actually LEADERSHIP. There is a great book that is a fable about a peacock who struggles to be itself while surrounded by penguins that follow the status quo. The message is around the strength, courage, and creativity required to be a leader. "Peacock in the Land of Penguins" echoes how to manage the increasing diversity and challenges of the workforce and how to stand out to drive true change. Our leaders create the culture-a culture of curiosity, experimentation, and adaptability to change. Never forget giving someone a leadership title does not make him or her a leader. Neither does experience. If they are not wired to be authentic and courageous, titles, training, and coaching will never change. Without the right leadership to inspire change and build the workforce of the future, your company will never truly be re-imagined! My family and I escaped a revolutionary war and came to the United States with one bag and $500 in our pockets. The real trauma and struggle had just started as we started over, speaking little English, learned a new culture and system. This built a foundation of perseverance, resiliency, and gratitude; it enabled me to build a tech company that was sold. I have a natural entrepreneurial thought process, to explore the possibilities, and find a better way. I believe passion fuels any dream or goal. If I can impact just 1% of the people around me, and make a difference in this lifetime, then I have met my purpose. I believe complexity and perfection is the enemy of execution and innovation. I love inspiring teams and leaders to think differently and create the future by getting past conventional ways of doing things. I believe that leadership and mentoring is the foundation to create the TRUE culture of an organization. My diverse and strategic experience spans various leadership roles at both start-ups and complex enterprise organizations, from leading strategy and innovation to executing and delivering multi-million-dollar programs. As a leader, I thrive on bringing people together and empowering and mentoring to get things done. With a commitment to inspiring, spoke at Ted on the "The Value of Deep Human Connection", and various other events, schools, coding camps and shark tanks to encourage careers in STEM. Content contributor for Forbes Council, Huffington Post, Business Insider, Women Technology I supported myself through school while building a business, and from my perspective grassroots education is the most crucial. As an avid athlete, devoted to health and fitness, I believe health and athleticism is your foundation and teaches you to set a vision, strategy, execute pivot, and learn. Coupling my passions for sports, fitness, innovation, and giving, I also developed an online wellness program to connect the community and inspire getting better every day.